The Metro service is expected to benefit a large number of commuters in both the cities, where mass public transport has been mostly unavailable, and the NMRC expects a daily footfall of over one lakh passengers. The Aqua Line of the Noida Metro Rail Corporation (NMRC), connecting the twin cities of Noida with Greater Noida, will be inaugurated by Uttar Pradesh chief minister Yogi Adityanath on Friday. The Aqua Line, connecting the twin cities of Noida and Greater Noida in Gautam Buddh Nagar was opened for the public on January 25, 2019, by Uttar Pradesh Chief Minister Yogi Adityanath. 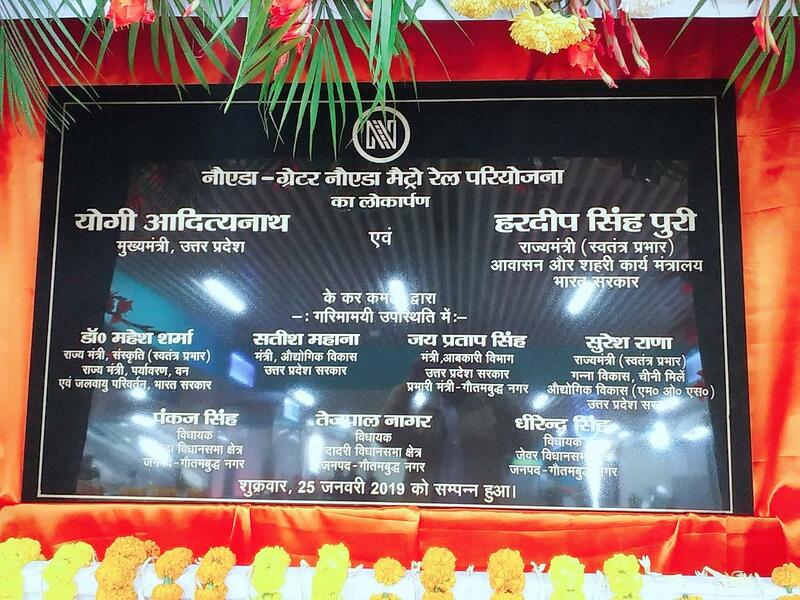 “Today we dedicate the Noida Greater Noida metro rail to the people of the region. The Aqua Line, which has been completed in record time, will provide better connectivity to the region and prove to a milestone in the development of the region,” Adityanath said. Constructed at the cost of Rs 5,503 crore, the 29.7- Km section with 21 stations will be the longest Metro line in the country to be inaugurated, The Hyderabad Metro held the earlier record at 29km. Travelling one station would cost Rs 10 on an QR-coded ticket and Rs 9 via smart card; 2km would cost Rs 15 on ticket and Rs 13.50 on smart card; 3 to 6km would cost Rs 20 via ticket and Rs 18 on smart card; 7 to 9km would cost Rs 30 on ticket and Rs 27 on smart card. Travelling more than 10 stations but less than 16 stations would cost Rs 40 via ticket but Rs 36 via the smart card. Travelling beyond 16 stations would cost Rs 50 via ticket and Rs 45 via the smart card. The Aqua line from will have a frequency of 15 minutes. It will have 19 rakes with four cars each. Every train is designed to run at a maximum speed of 80 kmph, clocking an average speed of 37.5 kmph. The trains are equipped with a passenger information system, a public address system, and an emergency announcement system from the operation control centre. Besides, all the stations shall be equipped with platform screen doors. Seat reservation through different colours has been done in the coaches for women, senior citizens and disabled. Dedicated space has been provided for wheelchairs in driving trailer cars at both the ends of the trains. The 49th battalion of the Uttar Pradesh Provincial Armed Constabulary will be responsible for the security on the Aqua Line and some private security personnel will also be deployed. It would run between Sector 71 station in Noida and the Depot Station in Greater Noida. There are a total of 21 stations on the corridor – 15 of them in Noida and six in Greater Noida — spread over a distance of 29.7-km. The work on the Aqua Line started in May 2015 and was completed in a record time of three-and-a-half years.